This was my bible during my first year as a professional music therapist. Throughout the nine months prior that I spent in internship, I compiled songs that I thought might come in handy (or already had) for music therapy sessions. I’m so glad I took the time to do that way back when, because here I am, four years later…still referring back to it and adding new songs as I go. Of course, not every song is relevant anymore, especially now that I write most of my own material. But every single song on my recent list of 12 Songs Every Music Therapist Should Know can be found in this giant binder, as are many of the songs I’m about to add to that list. Notice the nice little scroll box? Right around song #35, I decided it was mandatory. Hopefully I’ve given you some new ideas for songs to add to your own repertoire…and like my last “essential” songs post, I want to know: which tunes am I still missing? this is great! thank u! I am just in the process of compiling and similarly organizing all my piano arrangements. I actually had to hire someone to help me with this because it’s more than 30 years worth of special this and special that for special children…and then I’d misplace an arrangement and write a new one. No computers for more than half the time I was collecting and arranging…you can imagine the boxes I went thru and the recycling afterward. It took a month to sort through it all. My wonderful helper is here as I write to you…she’s completing the next phase of organization for me. I wish I’d had the foresight to see what I was going to be like as a teacher. What a great list!! Thanks for some new ideas. I would add Puff the Magic Dragon…one of my personal favorites! I was also going to add Puff the Magic Dragon, but I see Courtney beat me to it! I would also add “Don’t Stop” by Fleetwood Mac to the list, a great song about hope for a bright(er) future and easily adaptable for younger ages. When you put your music together did you put the lyrics and chords into your own word document and then put it in your binder? Hi Sarah – yes, that is exactly what I did. I was just looking over your list trying to find special “relapse prevention” or motivational songs, and I noticed “wasted” by Carrie Underwood was not listed. It is a great one for relapse prevention (I am sure we are in different fields of work and we work with different populations of people, I am not a musician so chords and lyrics don’t help me but I work in a Behavioral health unit, and I understand the effect music has on emotions and motivation). Also “I will stand by you” by Rascall Flatts is a great one I think of using with patients everytime I hear it. Definitely check out music by artist, Matthew C. Shuman. His music is so therapeutic! Especially his “Escape from Reality” CD. great accomplishment. Did you have your book printed? Wonderful collection! The Shaker song “Simple Gifts” and Louis Armstrong’s “What a Wonderful World” leap to mind as positive songs you might like to use. Just a heads up. Hallelujah was written by Leonard Cohen. It was covered by Jeff Buckley. Great list. 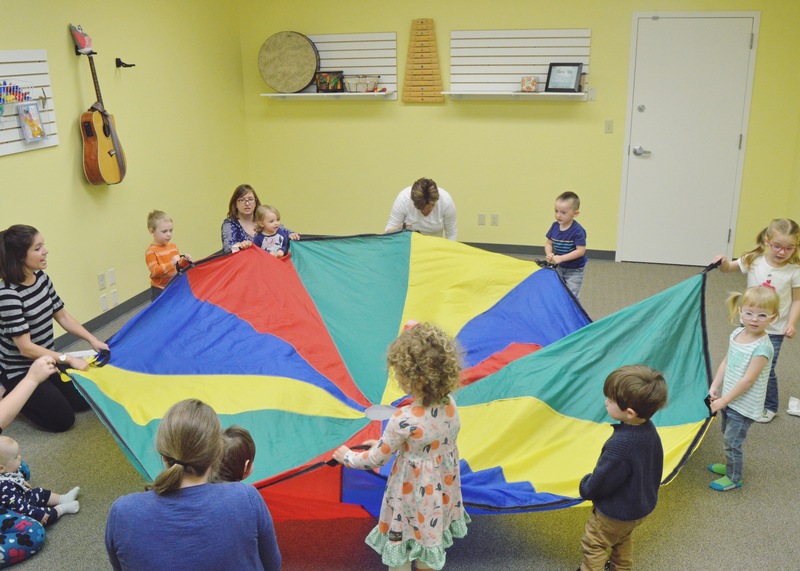 I am not a music therapist but I do a weekly music class for children ages 18 months to kindergarten. I use your songs all the time, so thank you. I would add The Doggy Blues (I heard my dog bark), Matilda the Gorilla, and The Goldfish song. I use these songs all the time and the kids love them. I’m so glad that you shared this! What a great resource and will save me, a first year Grad MT student, a few headaches down the road. Thanks again and hope to see you at a conference sometime. You’re very welcome, Josh! Happy to help. Best of luck with your studies. Would love to meet you at conference! I can’t thank you enough for sharing such an amazing resource! As I am preparing for my upcoming internship, I have slowly been collecting songs to put in a binder and this is beyond helpful. Do you have tips on you organize these songs? For example, by genre, alphabetically, client population, etc. Thank you! Hi Kayla! I am so happy that you found this helpful. I like to organize alphabetically by goal/objective category (movement, reminiscing, cognitive skills, self-care, greeting songs, etc.) since there is so much crossover when it comes to client population. Best of luck in your internship! 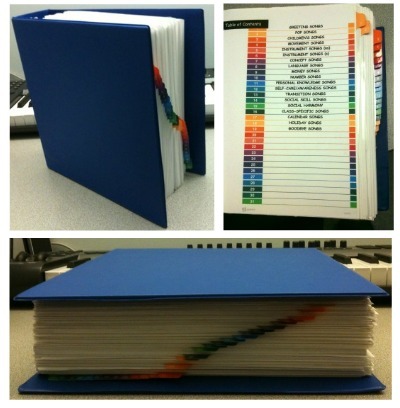 Did you use sheet protectors in your binder or just hole punch each page? Hi Jenny, I just hole punch each page. If you hear Katie Lang sing “Halleluljah” you might have a new favourite. She’s Canadian and did it for the Olympics in Vancouver. Very powerful. Hi Lynn! I did see her perform that song — one of my favorites to begin with, but I immediately downloaded her version after hearing it. Good stuff! My name is helen. This is for my Daughter whom is sixteen years old and she has many hardships in her life and she loves music and I want this for her because she needs all the help she can get. Hi Cynthia – I’m so glad you found this post helpful! And those are both great songs to know as a music therapist :) Thanks! And best of luck in your music therapy internship. “I’m Moving On” by Rascal Flats is also a good song for Relapse prevention. I’m also in behavioral health and addictions. My recovery groups just worked with this song and it was powerful. That’s a GREAT song, Lisa. Thank you for adding it to my list – I hadn’t thought of it in that context. Just found this via Pinterest. Some of those songs I have already in my collection for my learning disabilities group but lots more you have listed that I hadn’t thought of – especially with simple repetitions like zip a de do dah & Ta ra ra rah boom de ay Thank you.